The last in the “Bourne Film Series” – The Bourne Legacy doesn’t have Jason Bourne as the protagonist! The film also doesn’t have much resemblance to the book as well. It is the story of Aaron Cross (played by Jeremy Renner very convincingly) – an original character (not found in the book). Of course, Jason Bourne is present in some scenes via old footage! The movie have discussion and exploration of Treadstone organisation, mainly via the queries and investigation initiated by Pamela Landy. But it is not the main focus of the movie. The movie starts with adventures of Aaron in the ice covered rugged terrain of Alaska as part of his training exercise. The scenes of the exercise, Aaron’s efforts and actions of survival, and the extreme conditions are filmed very effectively. The scenes are very thrilling and the background music adds to it positively. He is one of the finest soldiers and he broke the record as the fastest accomplishment of the training exercise. He reached to his target in 2 days less than expected schedule! Around six weeks ago the CIA lost trail of Jason Bourne is Moscow. 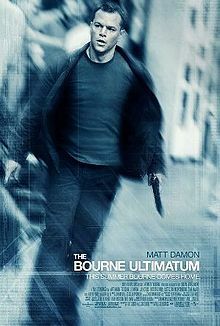 The chase will remind you the climax of the previous film The Bourne Ultimatum. Aaron is a government operative who is part of experiment of usage of some pills which are known as “chems”. The pills are intended to enhance the physical and mental strength and abilities at a large extent. Aaron meets number three (another operative of the same program) at the remote cabin where he reach at the end of his training run. At Waterloo station of London, a reporter named Simon Ross is killed, despite of genuine efforts of Jason Bourne to save him! Simon was investigating the Treadstone stuffs, which became the reason of his death. Bourne was able to expose the illegal usage of the programs like Treadstone and Blackbriar. The key persons like Ezra Kramer (CIA Director), Pamela Landy (Deputy Director of CIA), Noah Vosen (Blackbriar supervisor) and Albert Hirsch (medical director, Treadstone); are affected with this exposure in one or the other way. A series of events then lead the officials to deploy killer drones for Agent three and Aaron in Alaska. Number three got killed in the attack while Aaron was able to survive by some moments. Aaron plays intelligently as he knew that the attack would be reinitiated as the officials will know that he is alive due to RFID implanted into his body and thermal censors. He plays intelligently to fake his death then in the next attack. These scenes are filmed really well and it will be a thrilling experience to watch them. It then followed by a series of actions and chain of reactions to this event and finally unfolds the story. Some of the events are really thrilling, some are not so. But we can say Jeremy is the top performer in the movie. He has the physical appearance and strength to play the protagonist and he worked hard on his flexibility. He is also very expressive, and his facial expressions play a major role in playing the character convincingly. Rachel is another good performer. She looks pretty at places and not so at the other. But her acting makes her convincing. Almost all the other actors plays their role with honest efforts. The locales of various locations from different countries are explored nicely. And the climax is thrilling. It is makes the movie carry forward the series nicely. The dialogs are simple and effective, so does the script. The casting director performed the job well to find proper actors for the target roles, and they won half of the battle there itself. So if thrillers are your cup of tea, you will surely like the film. Some – behind the scenes – footage available on Internet (and included in DVD) will make you enjoy it and realise about the hard work the entire cast and crew went through.